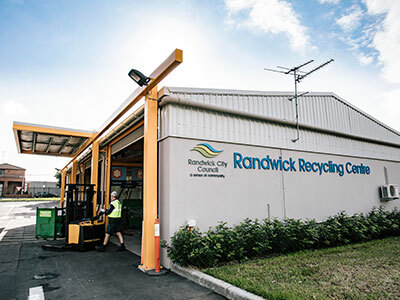 The Randwick Council Recycling Centre is located at 72 Perry Street, Matraville. The Recycling Centre is open Monday to Friday 6am to 3pm, Saturday 7am to 2pm and is closed on Sunday and Public Holidays. Please see below for operational hours. What items do we accept at the centre? Drop-off your household problem waste for recycling and appropriate disposal. 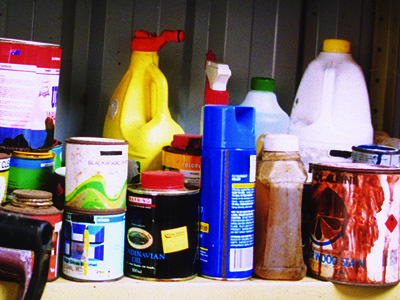 Problem waste- please note only household quantities are accepted 20kg or 20L maximum container size accepted. Small businesses are not permitted to use the service. Randwick residents can recycle more, by taking any excess yellow bin recyclable material to the Recycling Centre. All items listed below can be dropped off for recycling. In addition, residents can drop off polystyrene boxes and plastic bags/soft plastics for reprocessing. Note polystyrene and plastic bags/soft plastics cannot be recycled through the yellow lid bin. Randwick residents can recycle more, by taking dropping off extra garden material to the Recycling Centre. this service is available only on Saturdays between 7am and 2pm and a limit of 2m3(the same size as a small trailer load) per visit applies. All items listed below can be dropped of for recycling. Please note we DO NOT accept large branches, logs stumps and timber products. Randwick residents only are permitted to drop off garden organics to the Randwick Recycling Centre for recycling. ID is required to use the service. Australians buy an average of 27kg of new textiles each year and then discard about 23kg into landfill – and two-thirds of those discards are manmade synthetic/plastic fibres that take a very long time to breakdown. You can now recycle your Clothing at Randwick Recycling Centre- 72 Perry Street Matraville. X-Ray films contain silver in the form of halides, which can be extracted and converted into pure silver. Hence recycling of X-Ray films is a more responsible action rather than disposing in your red lid rubbish bin. Randwick residents can drop off their electronic waste for recycling. Randwick residents can drop off white goods and metal recycling. What do I do with white goods that still work but I no longer want? We encourage residents to look out for organisations that will collect white goods that are still in working order. White goods should not be disposed of in Council's red lid-rubbish bins, yellow lid-recycling bins or green lid-garden organics bins. However, residents who cannot drop off their white-goods can call council to book a clean up. Can I recycle white goods? Randwick residents only can take their white goods to the Randwick Recycling Centre for recycling. ID is required to use the service. Through a grant from the New South Wales Environment Protection Authority (NSW EPA) in partnership with the Australian Packaging Covenant, the Council now has polystyrene processing machinery. This initiative aims to increase recycling of polystyrene and reduce waste to landfill, benefiting our community and helping small businesses save on waste management costs. Residents and small businesses can now take their polystyrene foam boxes to the Randwick Recycling Centre for recycling. Open Mon-Fri 6am to 3pm, Sat 8 to 11am. Maximum quantities/size accepted: 3m3, limits will be strictly enforced. We accept plastic bags and other soft plastics for recycling. Find more more about soft plastics recycling.